I cut my nails Monday, not down to the quick this time but no more nails bending in half! I was wearing Paint Your Toron-Toes Rose earlier that day, it's from the Canada collection (lol am I Captain Obvious or what?) and it is a bright frosty berry color. It is so pretty in the bottle, you see deep gold shimmer throughout, and on the nails, nothing. Despite the lack of gold shimmer, it is very pretty. I would have worn this longer but after all the filing it chipped. I wore China Glaze BFF yesterday with my shorter nails! I haven't updated my blogroll in a while, I've bitten off more than I can chew I think. I can't keep up on my blogs lol. Well anyway if you'd like to be on my blogroll let me know! You can email me or leave a comment. Man, Kae, I am so far behind in commenting, I may never catch up. I have been just trying to keep up with the most recent posts and go backwards a tad! It gets a little crazy with all of my "subscriptions". 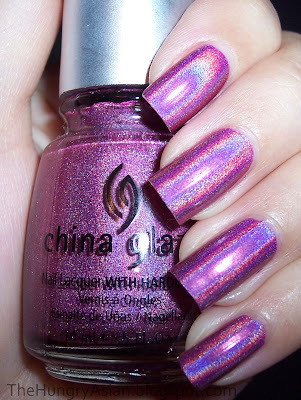 The OPI is pretty, but that China Glaze blows it out of the water, it's really stunning! yah I do the same, but when I have to stop and come back later to pick up where I left off, there's even more new posts and the endless cycle begins haha. I need to get the rest of the omg collection! Both colours look gorgeous on you! Oh I love the China! It looks like it could blind people in the sun! I love that OPI polish!! Those are both really nice polishes but I LOVE the BFF one! My blogroll is ridiculously long now as well. I just keep finding more and more blogs! I wish I could shape my nails like yours. I love them. I just don't seem to be able to do it! BFF is super pretty! I think all that gold is doing something below the surface in Paint Your Toron-Toes Rose. It's has a lit from within quality. Violet! Haha I think it does! Ooh a holo would look great on you I bet, I'm always telling Helen to wear them lol. kae ur nails are amazing,i love these colours on you spicaially BFF thats going to be apart of my haul hehehhe i just bought it yesterday. I like the OPI but I LOVE BFF!!! And your nails are some of the most gorgeous ones I've seen. I'm sure some of it is just in your genes, but if you have ever posted any care tips, I'd love to know what you do!! kae!!! both look amazing on your nails! even your shorter nails look so elegant! :) i love the colors! like other people who commented, how do you keep them so healthy? i'm terrible at doing my nails and im tempted to buy those revlon self adhesive nails...is the glue really damaging? Haha painting them is worth it I think! Your nails look incredibly beautiful with that color on. The rose shade is gorgeous. I take biotin also. It's really helped me. I hadn't had any nail growth in a very long time. If it only does that I will still be happy. That holo is amazing. Love it.